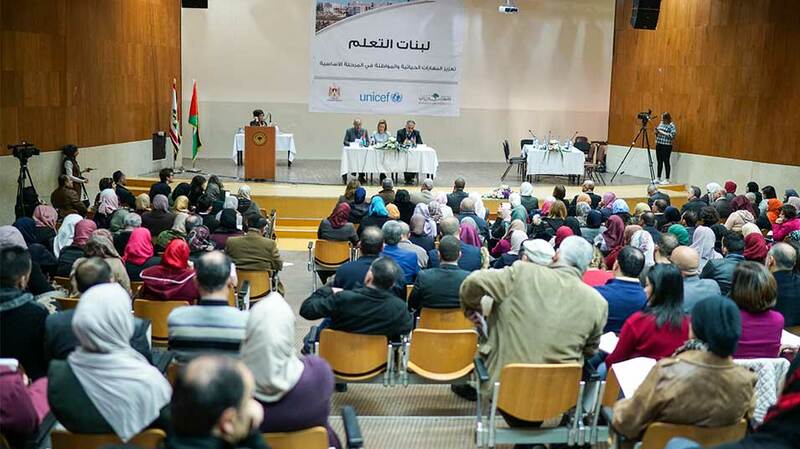 The Center for Continuing Education at Birzeit University, in cooperation with the Ministry of Education and Higher Education and UNICEF, launched the first phase of the Experiential Learning Objects (xLOBs) for grades 1 through 4 in a symposium entitled, “Integrating Life-Skills and Citizenship Education into Basic Educational Systems.” The symposium, which aims to create an interactive, participatory learning environment, was held on February 7, 2018. Attending the symposium were Vice President for Academic Affairs Dr. Faisal Awadallah; Ministry of Education and Higher Education Undersecretary Dr. Basri Saleh; UN Special Representative in Palestine Genevieve Boutin; Ministry of Education and Higher Education Director General of National Institute for Educational Training Dr. Shahnaz Far; Director of the Unit for Learning Innovation at the Center for Continuing Education Dr. Osama Mimi; a group of directors from the Ministry of Education and Higher Education; and a number of teachers, instructors, and Birzeit University faculty members. Dr. Awadallah confirmed Birzeit University’s full commitment to the established partnerships with all Palestinian institutions to achieve and implement any projects or plans that aim to develop the Palestinian community and its institutions. He also thanked the Ministry of Education and Higher Education and UNICEF for their efforts and confirmed the university’s readiness to employ all its scientific, academic, and technical expertise. “We affirm the partnership model between the various institutions that planned, designed, implemented, managed, evaluated, or funded the project. It is an effective model that can be modeled by all institutions which wish to implement a successful partnership between the public sector and academic institutions,” said Dr. Awadallah. Director of the Center for Continuing Education Marwan Tarazi explored the inner mechanics of the project and its prospects, and author and researcher Malik Rimawi presented a study of the effect of the Experiential Learning Objects on teaching practices and student performance in primary education. The symposium also featured two roundtable discussions. The first, “Learning Objects in a Scientific Context,” was facilitated by Dr. Nader Wahbeh and attended by Dr. Shahnaz Far, Dr. Osama Mimi, Malik Rimawi, and Maurice Backleh. The second session, “The Experience of Applying Learning Objects in Palestinian Schools,” was chaired by Dr. Shahnaz Far and attended by Vivian Tanous and a number of school principals, supervisors, and teachers. During the symposium, CCE and its partners showed a film which highlighted the efforts of Birzeit University and the Ministry of Education and Higher Education’s teams, as well as the process of utilizing Learning Objects in classrooms.